DONATUS, SECUNDIAN, ROMULUS, and COMPANIONS, a group of over eighty Christians martyred in 304 during the Diocletianic Persecution at Porto Gruaro, a part of present-day Metropolitan Venice. 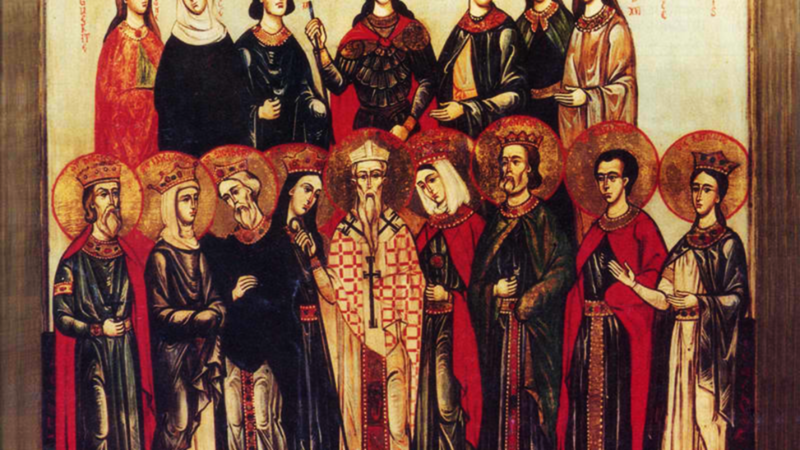 FAUSTINUS and COMPANIONS, (Date Unknown), a group of forty-five martyrs who are believed to have been martyred in Rome. Unfortunately, besides St. Faustinus’ name there are no further details extant. FINAN, an Irishman by birth, he succeeded St. Aidan (31st August) as Bishop of Lindisfarne. In his earlier life as a monk at Iona, St. Finan was a staunch supporter of the Celtic ecclesiastical traditions, opposing the successors of St. Augustine of Canterbury (27th May), who strove to bring English customs into closer conformity with those of Rome. He converted Kings Peada of Mercia (r. 655–656) and Sigeberht of Essex (r. c. 653–660/1) to Christianity, and along with St. Cedd (26th October), and others, evangelised the most southern regions of England. St. Finan reposed 661. FINTAN, St. Fintan lived as an anchorite at Clonenagh in Leinster. In time, numerous disciples, including St. Comgall of Bangor (10th May), and St. Columba (12th December) gathered around St. Fintan who became their abbot. He has been compared by the Irish annalists to St. Benedict of Nursia (11th July) and is styled “Father of the Irish Monks”. St. Fintan reposed 603. FORTCHERN, (Fifth Century), one of St. Patrick’s (17th March) earliest converts in Ireland. St. Fortchern devoted himself to the service of St. Patrick and is said to have refused to be consecrated bishop out of humility. Unfortunately, the details of his life have been intertwined with that of St. Loman (vide infra), hence nothing further about this saint can be said with any degree of certainty. GUEVROCK (GUEROC, KERRIC), (Sixth Century), a native of Brittany, St. Guevrock was a disciple of St. Tudwal (30th November), later Abbot of Loc-Kirec, and at one point an assistant of St. Paul Aurelian (12th March) as well. HABET-DEUS, a Bishop of Luna in Tuscany, of which only ruins exist today. As far as is known St. Habet-Deus was martyred by the Arian Vandals circa 500. LOMAN (LUMAN), the first Bishop of Trim in Meath, St. Loman is said to have been a nephew of St. Patrick (17th March). He seems to have reposed in the mid-fifth century Unfortunately, the details of his life have been intertwined with that of St. Fortchern (vide supra), hence nothing further about this saint can be said with any degree of certainty. SILVINUS, a member of court, who gave up his life in the world to preach the Gospel, enlightening the area near Thérouanne in the north of Gaul. After some forty years of unceasing work, during which he paid the ransoms of many slaves, he went to the monastery of Auchy-les-Moines, where he lived the few remaining years of his life as a monk reposing circa 720.